Designed by "Jake" Satonica in 1960, the Grandma Lure has excelled as one of the most productive fish-catching lures on the market. Grandma Lures have been copied by many companies, but the action has never been duplicated. The unique action of this lure has been proven over and over again by the number of fish that are caught with it. Designed for casting or trolling, this lure is made of high impact plastic, with an extra strong Lexan lip, which will withstand even the largest toothy critter. 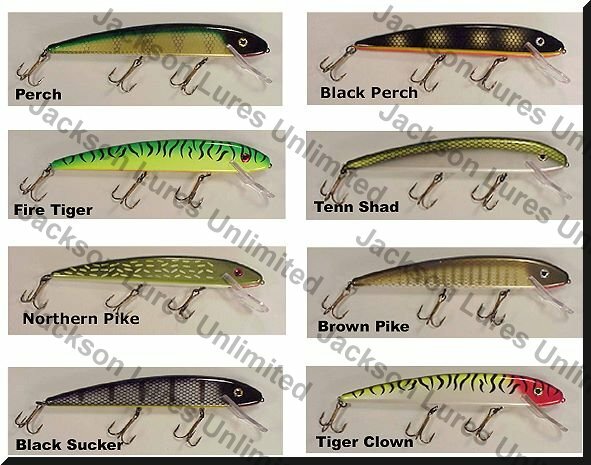 If you like to get down and bump over rocks and wood, these are just the tough lures that will get the job done. This lure is 6 inches long, weighs 1 1/8 ounces, has two treble hooks, and will cast and troll at a depth of 10 to 20 feet. 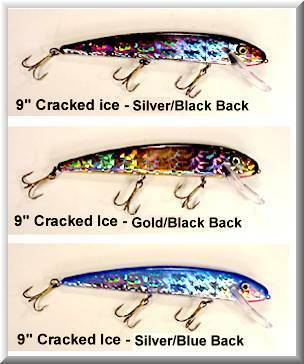 Here is the “in-betweener” lure…larger than the 6” Deep Diver, but smaller than the 9” crankbait. It fits into so many situations where a medium-sized crankbait is needed. Made of the same high impact plastic, with the same super-tough Lexan lip, built in Grandma quality, and available in seven new super colors. It is 7.5 inches long, weights 1.8 ounces, has three strong treble hooks, will retrieve at approximately 6 feet, and will troll at approximately 10 feet. All of this for our low price of only $15.00. The Black Sucker Is Out Of Stock!!! Excellent for casting and twitching, but especially for trolling, this is the classic upon which the Grandma tradition was built. 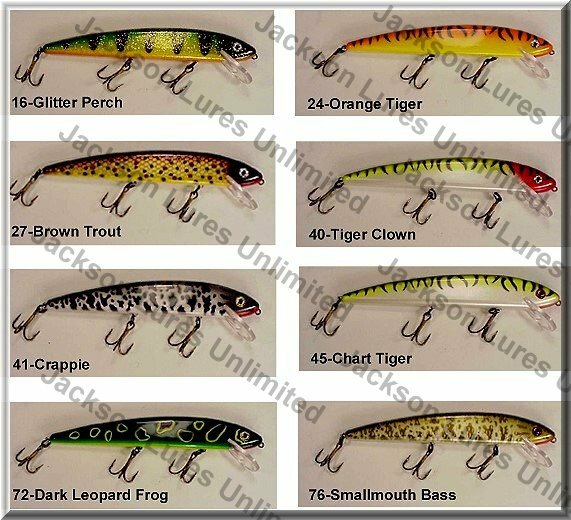 Made of high impact plastic, with a super strong Lexan lip, these lures are tough cookies. The life-like paint-job on these lures attract both fish and fishermen alike. The lure is 9 inches long, weighs 3 ounces, has three super-strong treble hooks, and will cast and troll at a depth of 10 to 20 feet. 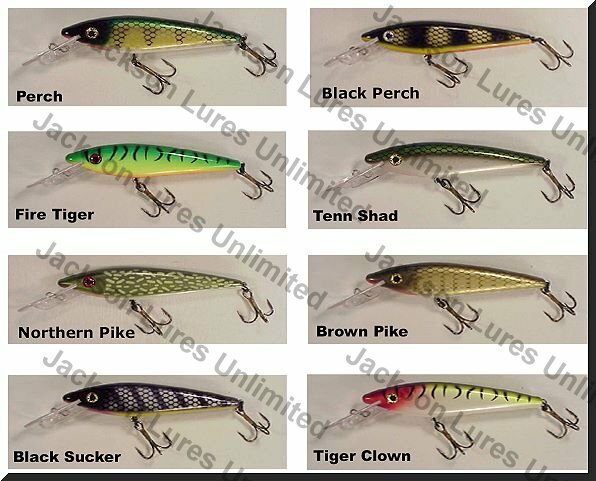 The Tennessee Shad And Black Perch Are Out Of Stock!!! 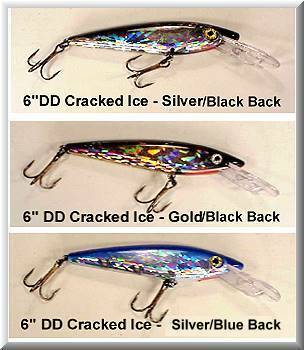 These Grandma Lures in their Prism Cracked Ice finish are something to behold! The photos do not do justice to the finish on these extraordinary lures. The flash of multi-faceted reflective finish on these lures will attract fish from a distance, and will be a great addition to your tackle box arsenal. 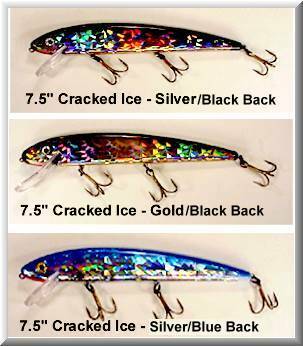 The Cracked Ice models come in three colors: Silver/Black Back…Gold/Black Back…and Silver/Blue Back. They have all of the great Grandma craftsmanship that is known world-wide…and the best part…they cost no more than the regular painted models!